Akagera Motors has signed a partnership deal with renowned vehicle manufacturer Mercedes Benz, as the German investors continue to loosen their stretch in the Rwandan market. The local auto market in Rwanda is gaining attention and has interested in various foreign companies to invest in the industry. Akagera Motors being exclusive distributor for Toyota (Japan), HINO (Japan), Mahindra & Mahindra (India) and Ashok Leyland (India), Fuso(Japan), Nissan (Japan), and Foton (China), will also now become the exclusive Mercedes Benz sales and service dealer in Rwanda. The partnership will enable the car dealer located in Kigali to get the latest model of the global automobile marque. 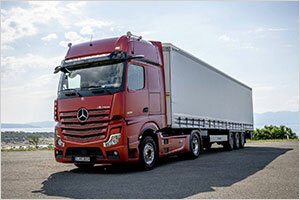 The launch of the deal memorialized over the weekend saw Mercedes Benz displayed the new Mercedes-Benz Actros, fitted with the latest technology to conquer the African terrain. Including the changes made for the commercial heavy duty truck include fuel efficiency, reliability and robustness. In November last year, Akagera Motors disclosed new heavy duty FUSO models including Fuso Canter, Fuso FI 1217, Fuso FJ 1823 R and Fuso FJ 2528 C and FJ 2528 R. There is a growing demand for heavy commercial vehicles in the Rwandan market that has opened investment opportunities for foreign firms to enhance business tie ups with the local industry to tap into the potential availability. German investors continue to establish their existence in Rwanda with the ease of doing business in the country luring companies. Volkswagen, one more German automaker established an assembling plant in Rwanda, rolling out its first ‘Made-in-Rwanda’ Polo car.